On 10th February, Michael Pitcher gave a talk on his upcoming work for his PhD. Michael is a first-year PhD student based in the School of Computer Science, whose research also involves close collaboration with the School of Medicine. 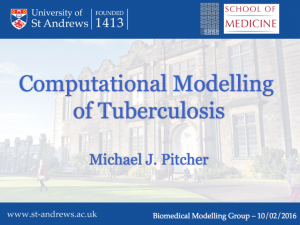 Michael’s work involves investigation of the use of computational models to simulate the progression and treatment of tuberculosis within individuals. These spatiotemporal models create a simulation of the host-disease interaction dynamics when a person is infected with tuberculosis, and the effects of different drug treatment regimens upon the mycobacterial infection. Current models present a small-scale, 2D representation of a small section of alveolar tissue during infection; Michael’s future work will investigate large scale coupled models connecting various section of the lungs using complex network techniques to create a ‘Virtual Lung’ which can be used to analyse treatment before real world in vivo and in vitro studies commence, and the use of 3D modelling to create more accurate representations.